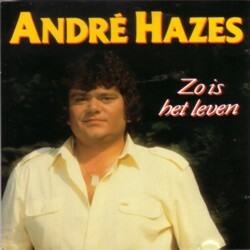 If you are not Dutch, you will probably not know who Andre Hazes is. But he is one of the most popular Dutch singers ever. He died a few years ago, but you cannot enter a bar for half an hour without hearing at least one of his songs. 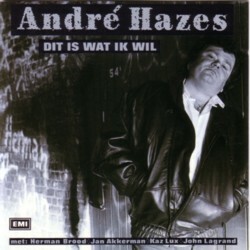 Andre Hazes started his singing career in the footsteps of Johnny Jordaan and other famous Jordaan singers, but later he became his own genre. I am not going to explain it, but if you are interested, there will be many Andre Hazes video’s on YouTube. When the man was at the height of his career, he began saying in interviews that he wanted to do more rock’n’roll. He did some rock’n’roll in his shows, but I always prefered to hear him sing his own ballads like ”De vlieger” or ”Eenzame kerst” , because his definitions of what r’n’r is, are pretty different from mine. In 1989 he recorded a CD with the music that he loved to sing at home: blues, soul and rock’n’roll. He wrote Dutch texts for some songs, but also sang some in English. He asked some of the most famous Dutch rock’n’roll musicians to play something on this CD, like Herman Brood, Kaz Lux and Jan Akkerman. I once heard Jan Akkerman say in an interview how he reacted to the Dutch lyrics of the songs that Andre wanted to record. Andre had sent him copies of these texts over the mail. He said that he spent a whole night puzzling, trying to find out how on earth these lyrics could be sung to the tunes. He even asked some of his friends. It was a complete mystery to him, and that was an extra reason to visit the studio: to find out how Andre Hazes would do it. And to his surprise, when Andre Hazes sang the lyrics, it all fitted perfectly. I don’t think it is a very good CD, but there are a handful of songs that are at least interesting. And here and there he sounds like an exotic soul singer from some Caribbean island. For the record: “De vlieger” is not one of Hazes’ own songs. De Zangeres Zonder Naam allready sung that when André was still at primary school. He adapted it, changed the melody a bit. I’ve never liked him, not as a person and not as an artist. I must admit he was good at what he did back in the days when he still wasn’t drunk 24 hours a day, and when he could still find his way home after leaving the pub across the road (I mean this man’s life was really sad and the post mortal heroic status is pathetic in my opinion, but to be honest I just dislike this kind of music, for almost the same reason you dislike Corduwener’s orchestra.